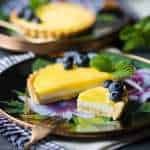 Lemon Cheesecake Tarts: with a tender, buttery shortbread crust, a fluffy layer of no-bake cheesecake, and a bright and tangy lemon curd topping! Whisk the flour, sugar, and salt together in the bowl of a food processor, stand mixer, or in a medium mixing bowl. Divide the chilled dough into 6 equal portions, and roll each to a thickness of 1/8-inch on a lightly floured surface. Press the dough gently into 6 mini tart pans, trimming away any excess. Prick the bottoms with the times of a fork, to allow steam to escape during baking. Bake for 18 to 22 minutes, or until set in the middle and slightly golden around the edges. Place the cream cheese and powdered sugar in a medium mixing bowl, and whip on medium speed until smooth. In a thin, slow stream, pour the heavy cream down the side of the bowl, while continuing to whip. When all the cream has been added, turn the mixer up to medium-high speed, and continue to whip until the filling can hold stiff peaks. Divide the cheesecake filling equally between all 6 tart shells. Spread in an even layer. Top each tart with about 3 tablespoons lemon curd. Garnish with fresh mint and blueberries. For more info on the crust, click here: Perfect Tart Crust Recipe.